Touring China and having a good time doing it in a wheelchair is increasingly possible, but its challenges shouldn&apos;t be played down too much. Here we explore what’s positive, what’s possible, and what’s problematic from customer feedback and first hand experience. The following is written by Alan Ashford, one of our customers from Australia, who uses a wheelchair. He and his wife Robyn visited Beijing, Shanghai, Taiwan, and Hong Kong in 2018. Here he shares his experiences, views, the wheelchair access problems he encountered and how they affected the tour or were overcome. The purpose of our trip was to learn about China and its people, not to review accessibility for disabled. But it’s important that I make my comments and give some opinions, based on my own casual observations. I rarely saw other disabled people, except for aged locals with family. We were struck by the courtesy of drivers in all of China. But we found Chinese people courteous, so it just carries on to road behaviour. No two people with disability are the same. China Highlights provided us with a tour to suit my capability. Everyone has to take responsibility and detailed planning is essential. I see major obstacles for larger powered wheelchairs in transport, accommodation, and general access. For information I am aged 72 with complete C6/7 lesion from an injury in 1965. My weight including folding manual wheelchair is about 83 kg (183lb). I use a lithium-battery-powered assistive device that assists moving on slopes and over long distances. I found it helpful in open areas but not suitable among pedestrians. I’m lucky in that I don’t need to use a washroom (toilet) more than once a day. It means I can’t say I have a reliable comment on how available they are generally or even at many attractions I visited. I can say that when I needed one, our guide soon found one. It puzzled me why every hand basin in accessible washrooms was surrounded by a handrail that made my access to it awkward. I now understand that these rooms mostly serve elderly Chinese who cannot use squat toilets. The rails give them support. Provided anyone using a manual wheelchair is prepared to accept help on one or two steps, and can manage most transfers themselves, I believe travel in Beijing, Shanghai, Taiwan cities and Hong Kong are doable. I had to accept help on ramps and walkways on many occasions except in Hong Kong. If strangers tried to help when I didn’t need it, I was mostly able to make that clear. In China, there is a strong culture of wanting to assist others. That may be especially true for the elderly. But with guides, I eventually accepted that it was more important to them to help me, than for me to be as independent as possible. I was the visitor. In my country too, some people find it difficult to understand why those with disability treasure what independence (abilities) they have. The hotel was adequate, and our private sedan transport was excellent. The driver quickly learnt just when and how to help. We had planned to visit the National Museum, but it was closed for refurbishments. This was a good substitute and access was fine. We discovered that wash-rooms with wheelchair symbols on every floor were unsuitable. They were only extended to allow front-on approach by a wheelchair. We eventually found one that was ideal after asking museum officials. I refused the peddle rickshaw to avoid being lifted and relied on the help of my assistive device and the guide (Nancy ). However, access into the hutong residence was really difficult and dangerous with steps up over a barrier and then down , before a door that was not wide enough for my wheelchair. I had to be carried. This was easy enough for me although the final steep ramps were a little risky. The hard work was done by others. I am so glad I did because it was the highlight of our trip. I will recommend this attraction to others in wheelchairs as long as they feel ‘adventurous’. 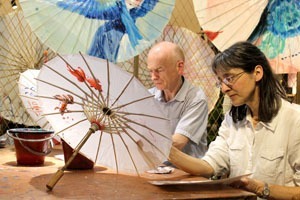 For more detail on Alan’s Mutianyu and hutong experiences, see Beijing Disabled Access. There were lots of little ramps but also limits for wheelchairs. I was warned and would not recommend it. As with so many ancient monuments around the world, it is not easy to create suitable access for people with mobility problems and we have to accept that. Access was no problem and this venue was surprising value, with Nancy’s insight about its significance to Chinese people. It exceeded expectations and obviously is totally accessible. Quite a lot of ramps make this a practical venue. Nancy had to ask locals for help in a few places along the walkway getting to the Long Corridor. This involved my being lifted wheelchair and all at corners. It did not seem dangerous as they were not high lifts (15–20 cm) and often more than two assistants helped . We found a suitable wash-room with no effort. Importantly, large sections of the Long Corridor have been made accessible. They were not greatly accessible, but again can probably never be. I saw enough to get an appreciation. Both were worthwhile. I enjoyed crowd watching while our guide and Robyn explored less accessible parts. The hotel ensuite was not practical for a wheelchair. Entry to the roll-in shower was very narrow and obstructed by the toilet pedestal. The vehicle had seats a little higher than requested but fortunately worked well. Shanghai Museum was excellent with good accessibility; so too the People’s Park. Museums are perfect for anyone with mobility issues. There are long queues outside because officials restrict the number inside and that ensures those inside have a good experience. Elderly people and those with disability were given priority entrance (no waiting) at museums. On our first night, we found wheelchair access to the elevated Bund difficult to find. Once found, the excellent ramp was a considerable distance from our hotel, and a problem only because there was no signage for wheelchairs and verbal instructions were misleading . Likewise, we found most shops where we were taken on Nanjing Road had step entries. Shanghai Tower and Maglev train were readily accessible and definitely worth doing. Each involved delay while our guide sought officials, needed to guide us to a single lift that provided the accessible route. The Bird and Flower Market was a little disappointing. Very narrow walkways made it awkward for the wheelchair, but I accept that change would spoil authenticity. Jade Buddha Temple and Yuyuan Garden were also limiting for the wheelchair but still worth the visit. Crowd watching is quite interesting. The private car was fine. I found Henry (the guide) very engaging and lots of fun. He also wanted to make my experience the best it could be. 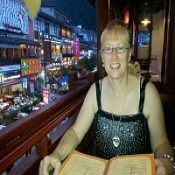 A good insight into Taiwanese and again full wheelchair access. They were quite remote, deserted, run down and disappointing; access was fair but not ideal. There was a mixture of surfaces and some were rough. The guide worked hard to raise our interest in lanterns. It was well worth the visit even though we had visited the taller Shanghai Tower. It gives good perspective of Taipei, though the haze was similar to Shanghai. Wheelchair access was fine. We rated it very highly as it has a serene atmosphere. . My wife is not religious but she found the temple ‘spiritual’. Wheelchair access was very limited. It was visually dramatic in a wide lake setting, reminding me of the Summer Palace. There was no entry for wheelchairs to the building because of steps. The hotel was good. The vehicle provided on the first day was purpose built for a wheelchair — ideal. However, the guide William brought a van to take us to the airport. This is precisely what I had said is unsuitable. After some discussion our baggage went with Robyn in the van to the airport and I went with the guide in a taxi. It worked out all right because as we had discovered on our free days, Hong Kong taxis are both cheap and ideal for a folding wheelchair. The railway to Victoria Peak is surprisingly wheelchair accessible considering it was built over 100 years ago. It was fair getting around at the top. Well worth it. We quickly established that it was not possible to board the ‘junk’ in my wheelchair because of steps. Lifting would have been very risky. The tour terminated early. There may have been better options for this city’s short itinerary. Alan’s account ends here. 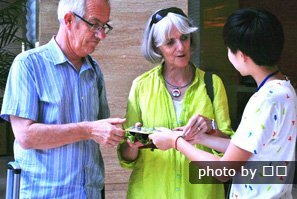 While mostly positive, there are certainly things we (China Highlights) can learn from this, and we are very grateful for Alan’s, Lynne’s, and other customers’ feedback which allows us to continuously improve our service. 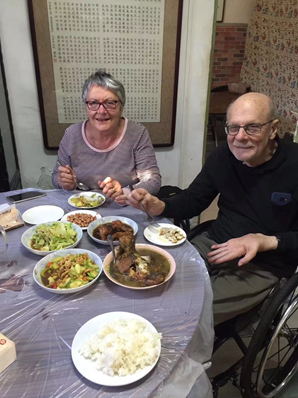 Overall, hopefully the impression you now have is that, with careful planning and good assistance, it is certainly possible to enjoy touring China using a wheelchair. I was hoping to write a positive article about disabled people visiting China, as I am a “glass half full” sort of girl, but also get told I can be too honest for my own good. Both my husband and I have 16 years’ experience taking disabled people to places and activities in the UK. Why is China like this? Being disabled, especially if that means you are in a wheelchair would be very difficult, in fact, in some places, nigh on impossible — unless someone took a giant iron to the place: everywhere has steep steps and uneven surfaces. I would advise anyone thinking of going to do so around 40–50, while you are still fit, as it is hard work on your hips and knees, never mind if you are trying to negotiate China in a wheelchair. Pavements are often uneven, except in big cities, and sometimes are just made of dirt so it would be really hard to push someone in a wheelchair, especially when it’s wet. Health and Safety is quite new to China, if there is work being done outside, there might be huge holes and a gangplank to walk over. It’s not that people don’t care — if you were struggling then most probably people around would get together and literally carry someone in their chair over any obstacle, it’s just that they don’t have any experience with people with disabilities. Just like the elders, someone with a disability would normally be looked after by the family, at home. Also the difference in cultures means that there are less people with walking disabilities like needing a stick, or a walker, as the elderly keep more active for longer. Once they have grandchildren they are kept fit running around after them, while their parents work. Then they also have the “free gym” in the form of the public park. Exercise keeps everyone fit and healthy, so again, there is little experience. Having said that, the parks are one of the only places we did regularly see people in wheelchairs, as there always seems to be a good deal of flat ground in the parks, even in mountainous regions. See China&apos;s Park Life. Hotels and tourist spots are slowly getting there. 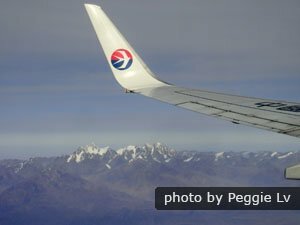 China Highlights&apos; Disabled travel page has a list of disabled friendly places. But sometimes you may find that although a disabled toilet is clearly marked with a wheelchair logo outside, it is often a step up. This may seem ludicrous to us in the UK but in China, unless the architect has a disabled relative, the step issue would not cross their mind — toilets in China are mostly up a step. 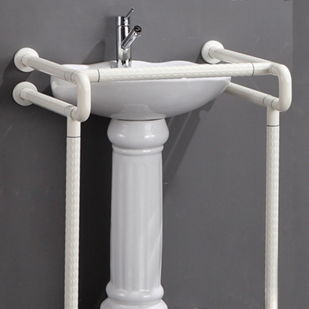 The handrails are useful, but unless you can manage to transfer from your chair to the toilet seat, you still can’t use it. I’m aware not everyone who is disabled uses a wheelchair, but it’s vital you know what you could be up against before you travel. Most toilets in China are squat toilets, so even finding a Western one may be a challenge in some places. Plan your itinerary for suitable rest stops if you would struggle squatting. As for the people I look after, who I push wheelchairs for, there are only a few toilets in China that have enough room to accommodate two people in a cubicle at a time, because the door is usually flush to the toilet bowl, except for room for your knees. Some older toilets don’t even have doors! Most airport toilets are very good, especially the ones at Chengdu Airport, but these were built within the last 3 years, lessons have been learned, and they are in a spacious room, on one level, and fitted with support rails and a pull cord alarm. We quite often found disabled toilets used as store rooms, as it is perceived they don’t get used very much, so “Why not?" This happens in the UK too, sometimes the hoover or supplies are kept in there, but we saw an extreme version in Mount Emei, where it looked like a building site, with bricks and rubble in it! I think China could use a Toilet Advisor. I’m willing to volunteer my services (for a liveable wage). I’m an expert in this field, and I believe it will boost tourism if I manage a toilet revolution. Does anyone know someone in the Chinese Government that I could speak too? 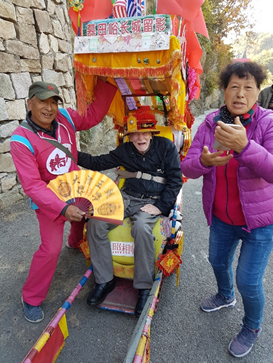 Mr Chu and his rickshaw provide disabled access to the Great Wall at Mutianyu. In some tourist spots they have what they call ”wheelchair taxis” — a sedan chair where you are carried by two strapping porters, on a chair, with bamboo poles that they carry on their shoulders. I paid 80 yuan (about 8 pounds) at Shibaozhai to go about 300 steps up a mountain in the blazing sunshine. Those men really earned their money, and a tip. I felt completely safe and didn’t look all sweaty in the photos. It was my birthday so I felt justified. But this shows that times are changing, that allowances are being made, even if you have to pay. If you are determined to ascend one of China&apos;s popular tourist mountains you may be able to book sedan chairs in advance. Contact us. Several tourist places have cable cars to get up mountains, like at the beautiful Yellow Mountains, but although the safety video shows a wheelchair user getting into a large gondola and applying her brakes, it did not show you how she managed at the cable car base. When we got out, we had to walk down about 6 flights of steps to the ground. The Beihai Hotel, on the Yellow Mountains, which we stayed in, had 4 floors, but no lift. But that somehow seems ok, because to get to the hotel you have to climb for 1 ½ hours up the mountain steps, so, really, you must be capable of climbing 4 floors once you get there. As white Europeans, Andy and I get starred at, pointed at and our photos taken, with our permission or without, all the time. This is because we are seen as some kind of “oddity”. I have ginger hair, which doesn’t occur in China, well not naturally anyway, and my husband’s very tall and his hair is white, as this too is unusual, it causes locals to look. And you will likely get this because of your disability. Try to remember this is a cultural thing, to stare in China is not considered rude. It is certainly not done with any bad feeling. In our experience a smile or wave back does the trick. Once they are sure you don’t mind, they usually pluck up the courage to ask for a selfie with them. They are just as likely to be asking for a photo because you are white as they are intrigued about other differences. If all this has made you angry, then good! What I mean is, that you will need to have a determined spirit to not let your disability beat you. If you do come to China, even in the big cities you would be somewhat of an innovator, which could prove to be very frustrating for you. And the trouble is, if you also don’t speak the language, communicating what you want, could be all the more frustrating. 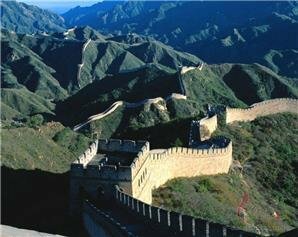 Despite the difficulties you will no doubt meet, China is a fascinating place, so, if you like a challenge, go right ahead. Be that innovator, break down barriers, give Chinese people a chance and your experience will benefit travelers in the future. — Take a private tour with a company who can cater to your needs. My advice would be to go for a China Highlights individual tour so you have your own guide. I would travel with someone who understands your needs. Maybe stick to the larger cities and known tourist spots. Be honest with your tour advisor before you go. If your expectations are nowhere near the same, you are likely to come back unfulfilled. You can check details of your itinerary, so you should not find yourself in the position of being one the 4th floor of a hotel with no lift, if you cannot manage stairs. So much of China is ancient; you may find yourself unable to do some of each tour. Look up the reviews from disabled customers themselves. You will have to weigh up if you think you can access enough to still make it a good holiday. If you go with an able-bodied companion, and are willing to compromise so that you both get the most out of the trip, much is possible. For example, if your wife is able-bodied, you could do what you can together. But if you are ok for your wife to go off with the guide, say up a pergoda, you could stay at the bottom having a cup of tea and take a photo of her waving at you when she gets to the top. We know of someone who was recovering from a heart attack whose husband did a mountain tour. But she organized a golf buggy to take her to the top of the hill, where she spent a gentle hour shopping. Then, before waiting for the buggy to return, she sat in the shade with a cold drink, and said she enjoyed just watching the world go by. On another, we saw one game OAP who walked with two sticks, but was determined to go on the tour which involved a ¼ mile walk along a wobbly wooden bridge. She just used it as an excuse to ask a handsome man to take her arm! I have two friends who use mobility scooters, both find that cruises are the way to go. They can easily get around on board, liners have even floors and lifts, and the cruise means they move to a new place daily without the trouble of flights. (Both however are able to transfer from their scooter to a chair, or bed themselves). I know that Victoria Ships&apos; Yangtze River Cruises will pull out all the stops to help disabled passengers. Provided they know when the booking is made, they can organize help with baggage and assistance with walking the pontoon. You just need to ask. 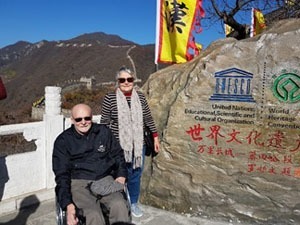 At China Highlights, we specialize in tailor-making China tours to customer requirements, so whether you are a wheelchair user or have another disability, we are confident that we can customize a trip that will give you access to many of China’s highlights. Beijing, Shanghai, and Hong Kong are three of the most accessible cities in China. Other cities on the Mainland are more challenging. Contact us for an individualized itinerary.